Maltstock is all about you, our guests! Sharing and Enjoying whisky and the company of old and new friends. Bring a bottle of whisky and share it on the sharing tables in the square, together with the story about this bottle. But, Maltstock would not be Maltstock without a great program. To give you an impression of what to expect at Maltstock you can find our10th anniversary edition program here. It was crazy packed with relaxed whisky goodness! 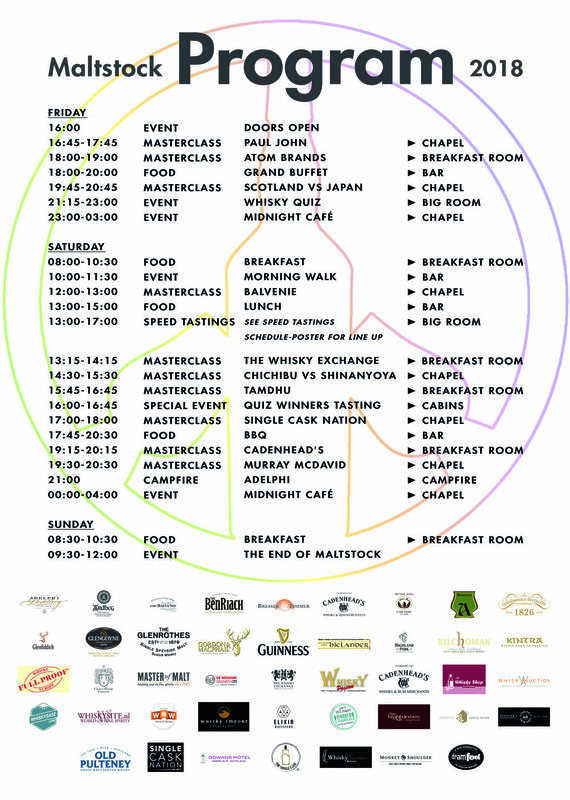 Below you can find our top notch Masterclasses, Events, and other program items such as our great Food and Drinks, Whisky Quiz and Midnight cafe which all featured in Maltstock 2018. Everyone with a Maltstock ticket will receive an e-mail so they can let us know their preferences. We will allocate all available seats as relaxed as possible. Each guest will get two masterclasses of his or her choice. We like to do things relaxed, so you have until late August to let us know your preferences. You will receive your masterclass itinerary a couple of days before Maltstock starts. Small groups, short sessions. Up to max 15 persons per tasting. And just 10 minutes for a talk about one or two drams. A great opportunity for our hosts to try something different. And for our guests to join another tasting of their choice. We will run the speed tastings throughout the Saturday afternoon. Of course the schedule will be available at Maltstock. It’s not possible to book the speed tastings. They’ll go on a first come first serve base. Just show up on time for the speed tasting(s) of your preference. After each speed tasting everybody will be asked to leave. a new speaker will come in and new guests can join. What else do we have for you at our 10th anniversary? The main thing of course is still to relax, meet old and new friends and share and enjoy a few relaxed whiskies. At the heart of Maltstock we have the share and enjoy tables where our guests leave the whisky they have brought to share with fellow enthusiast. Always great to see what people bring. So much to choose from, impossible to try all in just the one weekend. As always, food is an important part of a relaxed whisky weekend. We take great pride in arranging good and tasty food!